This is a guest post from Renee Viterstedt, part of the team behind the feature documentary PressPausePlay. A film most likely to find its audience with film festival goers, students and those truly interested in the magic of movie making, Side by Side takes an in-depth look at how a digital process has emerged to challenge photochemical filmmaking. 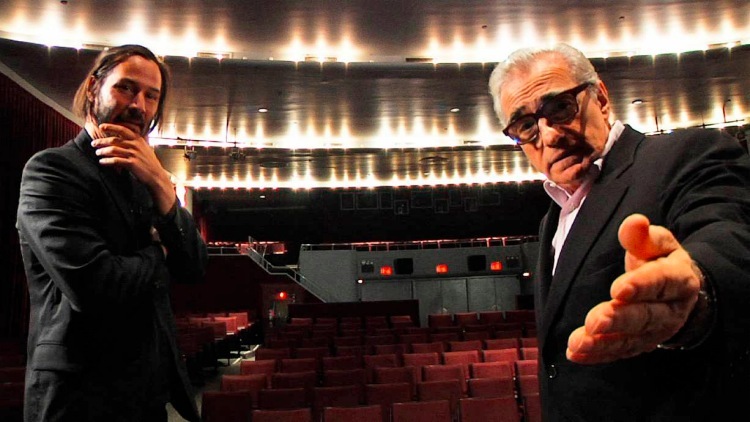 As the official website states: “SIDE BY SIDE is a new documentary produced by Keanu Reeves that takes an in-depth look at this digital revolution through interviews with directors, cinematographers, producers, editors and exhibitors.” I can only imagine that having Reeves as a producer on the film made getting interviews with Hollywood heavyweights such as Steven Soderbergh, Martin Scorsese, David Fincher and George Lucas a bit easier. It’s not just the directors who get to voice their opinions though, the film continues the conversation with cinematographers, editors, special effects supervisors and color correctors, who each explain in layman’s terms how digital has changed the way movies are produced and finalised. Overall the film is fast paced and packed with candid interviews that made the audience laugh out loud, intercut with a very thorough history of how emerging digital technology has impacted filmmaking. As part of the team behind the documentary PressPausePlay I was very excited to see the premiere of Side by Side at the Tribeca Film Festival. While our documentary focused on how digital tools have helped unleash creativity in an unprecedented way to create a democratised culture, this film looks specifically at how digital technology is increasingly pushing out traditional use of photochemical stock to make movies. Director Chris Kenneally has successfully created an educational documentary that captures not just the art of making film, but the extremely technical process required to make an artist’s vision a reality. The film, narrated by Reeves, asks industry insiders to explain why they choose to continue shooting on film or why they’ve gladly jumped to digital. From the most vocal supporters of digital which include George Lucas and James Cameron, to holdouts like Christopher Nolan, the film presents the varied views in Hollywood today in an unbiased way. While there isn’t a strong argument for either format, nearly everyone agrees that the balance of power is shifting continually towards digital. One of the points we realized making PressPausePlay was that digital tools have created an inexpensive, convenient way for anyone to tell their stories. As James Cameron points out in Side by Side digital tools now allow us to realize anything we can create in our heads and that means incredible possibilities. I, like many others in the Tribeca screening, left feeling that we truly are witnessing a turning point in history and this film captures the excitement of it all.